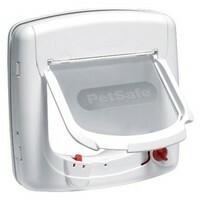 The Petsafe Staywell Deluxe 4 Way Infra-Red Cat Flap is a fantastic method of controlling your cat’s movements into and out of your home. It has been designed to only recognise cats wearing the special colour-coded infra-red collar key and can be set to one of 4 settings: Fully Open, Fully Closed, In Only or Out Only. this is a good product, though cats take their time learning (or agreeing) to use it. If buying a new one as a replacement, be aware you will get a random key colour. This is important if your neighbours have the same flap!